The answer is both. And most likely it will be a Class 6 Felony and it will probably be a rent check over $200 in value. Call the police and have the officer contact their lieutenant on duty if they are not fully up to speed on this law that appears to be last updated in 1981. § 18.2-181. Issuing bad checks, etc., larceny. Any person who, with intent to defraud, shall make or draw or utter or deliver any check, draft, or order for the payment of money, upon any bank, banking institution, trust company, or other depository, knowing, at the time of such making, drawing, uttering or delivering, that the maker or drawer has not sufficient funds in, or credit with, such bank, banking institution, trust company, or other depository, for the payment of such check, draft or order, although no express representation is made in reference thereto, shall be guilty of larceny; and, if this check, draft, or order has a represented value of $200 or more, such person shall be guilty of a Class 6 felony. In cases in which such value is less than $200, the person shall be guilty of a Class 1 misdemeanor. The word "credit" as used herein, shall be construed to mean any arrangement or understanding with the bank, trust company, or other depository for the payment of such check, draft or order. Any person making, drawing, uttering or delivering any such check, draft or order in payment as a present consideration for goods or services for the purposes set out in this section shall be guilty as provided herein. Good info. Unfortunately the Commonwealth's Attorney does not get excited about prosecuting these and feels that they become a collection agency for merchants/landlords. They are more interested in murders, robberies, drugs, drunk drivers, etc. and have to allocate the people to these. This is also problematic since if the deadbeat didn't have the money, they probably won't. As we all know, getting the judgment is the easy part; collecting is the hard part. That's too bad the Commonwealth's Attorney doesn't like to prosecute those cases especially considering that it is the law that he or she is deciding not to force. I don't see it the same as he does as being a collection agency for businesses specifically due to the fact that intentionally bouncing checks is a crime of larceny. Stealing someones service or products through their scam of writing bad checks. Here is a comment from a police officer that our member Gary received. The officer's name has been changed to anonymous. Hey brother, this is Anonymous, the Roanoke policeman you met at real estate class. Thank you very much for all of your help that night. Feel free to call me or email me any time. In reference to your question about bad checks. 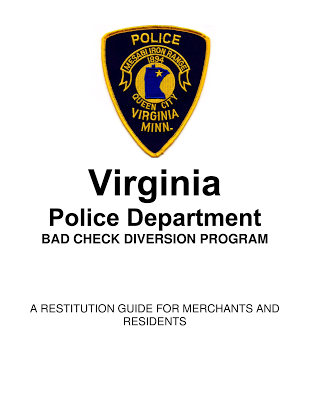 As far as Roanoke city goes, Go to the police department and ask a policeman for a felony consult form, that is a very simple piece of paper he or she fills out giving the magistrate permission to issue a felony warrant. Then take that form to the magistrates office and swear out a felony warrant. That will at least get you to court. If you ever get one of these call me and I will fast track the service of it. Let me know when a good time is to meet up with you in reference to discussing investment property.